PE0268. 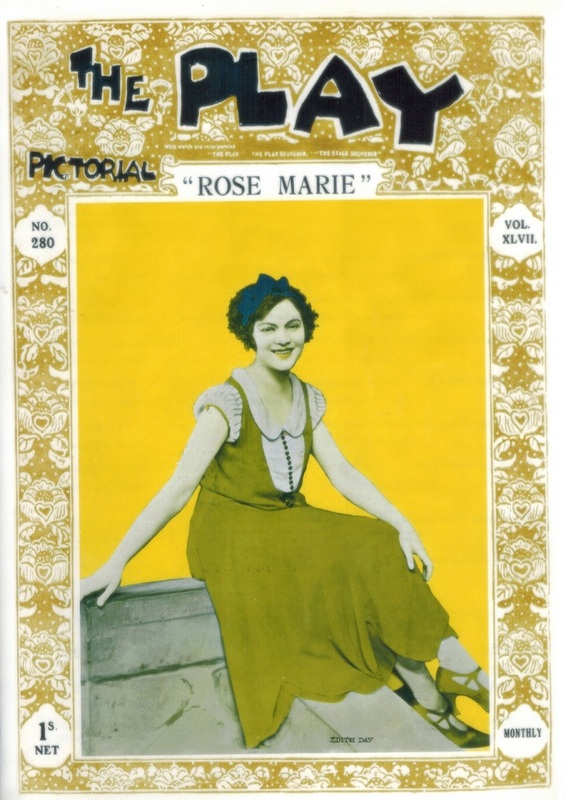 ROSE-MARIE (Friml), recorded 1925, (Original London cast), w.Edith Day, Derek Oldham, Billy Merson, John Dunsmure, Clarice Hardwicke, etc. (England) Palaeophonics 130, w.Elaborate ‘The Play’ 18pp. 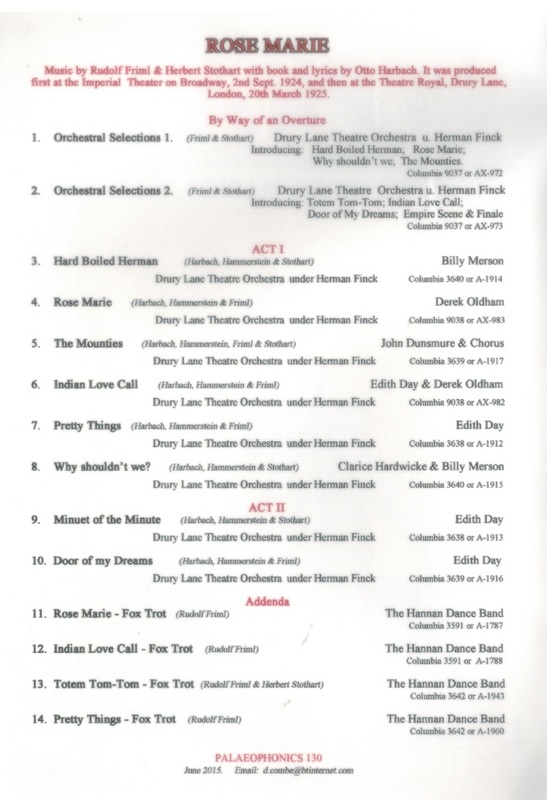 Brochure replete with photos of the production & biographies. Excellently transferred from the legendary Acoustic 78rpm rarities. “ROSE-MARIE is an operetta-style musical with music by Rudolf Friml and Herbert Stothart, and book and lyrics by Otto Harbach and Oscar Hammerstein II. The story takes place in the Canadian Rockies and concerns Rose-Marie La Flemme, a French Canadian girl who loves miner Jim Kenyon. The work premiered on Broadway at the Imperial Theatre on 2 September, 1924, running for 557 performances. It had a brief revival on Broadway in 1927. It was the longest-running Broadway musical of the 1920s until it was surpassed by THE STUDENT PRINCE (1926). It was then produced at the Theatre Royal, Drury Lane in London in 1925, enjoying another extraordinary run of 581 performances. It was filmed in 1928, in 1936 and again in 1954. Producer Arthur Hammerstein, attempting to create popular new Broadway shows in the operetta tradition, sought exotic, unusual settings for his new productions. THE FORTUNE TELLER (1898) is set in Hungary, THE MERRY WIDOW (1907) takes place in France, and NAUGHTY MARIETTA (1910) features New Orleans. He sent his nephew, Oscar Hammerstein II, and Otto Harbach to Québec, Canada, to witness a rumored magnificent ice sculpture festival. The men reported that there was not, nor had there ever been, such a festival in Quebec or any part of Canada. Arthur Hammerstein still liked the Canadian setting, and Oscar Hammerstein II and Harbach began work on the book for a new musical set in the Canadian Rockies. A touring company premiered the work in Canada on 12 January, 1925 at the Royal Alexandra Theatre in Toronto, and the piece toured Australia and played in Paris. “Derek Oldham was an English singer and actor, best known for his performances in the tenor roles of the Savoy Operas with the D'Oyly Carte Opera Company. It is difficult to imagine that Derek Oldham, so strongly associated with the D'Oyly Carte Opera Company and the tenor roles in Gilbert & Sullivan, served less than six seasons with the D'Oyly Carte. He was certainly a popular favorite on both sides of the Atlantic and in the recording studio, where he sang tenor leads in no less than nineteen full and abridged HMV recordings of the operasWith the outbreak of World War I, he joined the Scots Guards, serving with valour. He then starred in musicals and operettas in the West End in the 1920s, including MADAME POMPADOUR, THE MERRY WIDOW, ROSE-MARIE and THE VAGABOND KING. He returned to the D'Oyly Carte for brief periods from 1929 to 1937. Oldham continued singing, recording and acting through the 1940s, also appearing in several films. He concentrated on legitimate theatre in the 1950s, acting until the age of 70. He maintained a lifelong interest in Gilbert and Sullivan, serving as an officer of the Gilbert and Sullivan Society. As a child, Oldham was a boy soprano in demand for over five years in oratorios (including Sullivan's THE GOLDEN LEGEND and THE PRODIGAL SON). He débuted on the professional adult stage in 1914, as Julien in THE DARING OF DIANE, an operetta by Alfred Anderson and Heinrich Reinhardt, presented at the London Pavilion. In the summer of 1922, Oldham left the D'Oyly Carte to go into musical comedy. He would become a leading singing-actor at Drury Lane and other West End theatres throughout the 1920s. It was there that he met his wife, Winnie Melville, who would herself have a brief engagement with D'Oyly Carte Opera Company as principal soprano. His first musical was WHIRLED INTO HAPPINESS at the Lyric Theatre, as Horace Wiggs, where his leading lady was his future wife, Winnie Melville. Other musicals in which Oldham starred included MADAME POMPADOUR (1923, as Rene), THE MERRY WIDOW (1923, as Camille), and ROSE-MARIE (1925, as Jim). In 1927, Oldham and Melville starred together in the European première of THE VAGABOND KING, he as François Villon, and she as Katherine de Vaucelles. Oldham later played in many musicals and plays, including THE SONG OF THE DRUM at Drury Lane, as Captain Anthony Darrell (1931). He appeared at the Royal Albert Hall as Chibiabos in HIAWATHA in 1938, conducted by Malcolm Sargent. After 1948 he developed a career as a Lieder singer and lecture-recitalist and later as a character actor in non-musical plays. In his later years Oldham played in many revivals of musicals and on the legitimate stage as well. His last appearance on the London Stage was as Dr. Stoner in VERDICT (Strand, 1958). He also appeared in several films between 1934 and 1957.